Staten Island & Brooklyn Rules Blu-ray Review. I’m not sure whether to recommend this or not. The story could have been great, but wasn’t. This was a movie that could have been so much more than what it ended up being. A promising story with decent actors let down by poor timing and a script that needed a fair bit of tightening up. All three stories in this feature take place on Staten Island, hence the title. In a style pretty much pioneered in today’s popular culture by Quentin Tarantino, all three stories tie into each other, with the final tale doing the reveal and showing why the actions in the first two tales were undertaken. What we have are stories featuring the mob, a septic tank cleaner and a deaf mute deli worker. The tale begins from the mob angle and works its way to its conclusion. I found that so much more could have been done with this movie, which by the way was enjoyable but not so that I could highly rate it. I just found it to drag on and the way the movie was shot was pretty ordinary, feeling like a home move at the best of times. The performance of Vincent D’Onofrio was pretty lacklustre and felt phoned in. Ethan Hawke always inspires me but once again in some of the key scenes he seemed a bit unhinged and unconvincing. I just never felt dragged enough into the tale by these guys that I could score the movie higher. The strongest actor in this story was Seymour Cassel who played the part of the deaf mute deli worker Jasper Sabiano. His facial expressions brought to life his role and I couldn’t look away when he was on screen. This part of the tale was a delight to watch, however not enough to pick up the pieces for the rest of the feature in my opinion. I’m not sure whether to recommend this or not. The story could have been great, but wasn’t. The actors were capable of delivering solid performances but didn’t. If you want to see what could potentially have been a good story then sure rent this bad boy. Don’t buy it. This is a coming of age story in Brooklyn NY of three boys who as they grow older get involved in the local workings of the mob. I didn't enjoy this movie and found it to be slow to get to the point. The script certainly had promise, yet I am surprised when it was made that they didn't tighten up the screenplay somewhat as way too much time is taken with backstory that we simply don't care about. There are most certainly moments that have potential but for the most part it isn't realised, and I had trouble getting into it. It was at about the thirty minute mark that I actually checked to see how much longer I'd have to watch the movie, never a good sign. This title was released in 2009 to the market and the fresh faced appearances of the stars actually made me doubt the date. The movie is set in the 80's and does feature the attire and music of the time period. It is utterly tragic to revisit that time and see what we thought made for great clothing and music back then! This is not the fault of the movie by the way, just my thoughts wandering. If anyone shines in this title it would be Alec Baldwin playing the role of menacing mob boss. Those steely blue eyes burst out the screen and his scenes are quite the show stopper. Dialogue for Baldwin contains tension like a tightly coiled spring, and the seasoned actor really seems to get into the role, delivering it with gusto. From a video standpoint, Brooklyn Rules is a average affair, especially considering its release on Blu Ray. 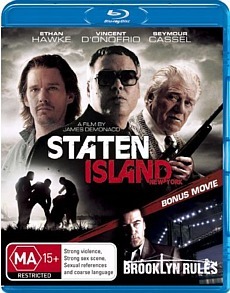 The version I have reviewed was on a dual feature disc with Staten Island. This was a simple review disc and with no accompanying material stating if this was the way it would be released to the public. Audio was another very standard affair with nothing really shining or worthy of special mention. It does the job, but could have been done a lot better. Dialogue is audible but at times somewhat fuzzy as though it was recorded a little too far from the source. There were no extras on this disc for Brooklyn Rules. I'd save this one for a very cheap rental when it goes weekly at your local video shop. Maybe.